Data from NASA’s Cassini spacecraft tie a shift in seasonal sunlight to a wholesale reversal, at unexpected altitudes, in the circulation of the atmosphere of Saturn’s moon Titan. At the south pole, the data show definitive evidence for sinking air where it was upwelling earlier in the mission. So the key to circulation in the atmosphere of Saturn’s moon Titan turned out to be a certain slant of light. The paper was published today in the journal Nature. A jet of X-rays from a supermassive black hole 12.4 billion light years from Earth has been detected by NASA’s Chandra X-ray Observatory. This is the most distant X-ray jet ever observed and gives astronomers a glimpse into the explosive activity associated with the growth of supermassive black holes in the early universe. Astronomers have used the Hobby-Eberly Telescope at The University of Texas at Austin’s McDonald Observatory to measure the mass of what may be the most massive black hole yet — 17 billion Suns — in galaxy NGC 1277. The unusual black hole makes up 14 percent of its galaxy’s mass, rather than the usual 0.1 percent. This galaxy and several more in the same study could change theories of how black holes and galaxies form and evolve. The work will appear in the journal Nature on Nov. 29. NGC 1277 lies 220 million light-years away in the constellation Perseus. The galaxy is only ten percent the size and mass of our own Milky Way. Despite NGC 1277’s diminutive size, the black hole at its heart is more than 11 times as wide as Neptune’s orbit around the Sun. Their more precise experiment in fact shows that the equilibration of the temperatures for hot electron and cool ions is actually three times slower than previous measurements have shown and more than ten times slower than the mathematical model predicts. This means that the basic process of electron-ion interaction is only poorly understood. Using ESA’s Herschel space observatory, astronomers have discovered vast comet belts surrounding two nearby planetary systems known to host only Earth-to-Neptune-mass worlds. The comet reservoirs could have delivered life-giving oceans to the innermost planets. Interestingly, however, there is no evidence for giant Jupiter- or Saturn-mass planets in either system. In a previous Herschel study, scientists found that the dusty belt surrounding nearby star Fomalhaut must be maintained by collisions between comets. In the new Herschel study, two more nearby planetary systems – GJ 581 and 61 Vir – have been found to host vast amounts of cometary debris. An international team of researchers from the National Astronomical Observatory of Japan (NAOJ) and the Japanese universities of Kobe, Hyogo, and Saitama used the Subaru Telescope to capture a clear image of the protoplanetary disk of the star UX Tauri A. The team’s subsequent, detailed study of the disk’s characteristics suggests that its dust particles are large in size and non-spherical in shape. This exciting result shows that these dust grains are colliding with and adhering to each other, a process that will lead to their eventual formation into planets. The team made a detailed study of UX Tau A in the near-infrared wavelengths. They measured the polarization (Note 2) of infrared light to find out the distribution of the dust particles that scattered the infrared light. Polarized light reflected from dust particles gives important information about planetary formation in disks. Even though dust particles only make up a tiny fraction of the protoplanetary disk, they can develop into planetesimals (solid objects less than a kilometer in diameter), and eventually, planets. You could call this “Pac-Man, the Sequel.” Scientists with NASA’s Cassini mission have spotted a second feature shaped like the 1980s video game icon in the Saturn system, this time on the moon Tethys. 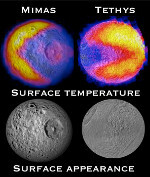 (The first was found on Mimas in 2010). The pattern appears in thermal data obtained by Cassini’s composite infrared spectrometer, with warmer areas making up the Pac-Man shape. Scientists theorize that the Pac-Man thermal shape on the Saturnian moons occurs because of the way high-energy electrons bombard low latitudes on the side of the moon that faces forward as it orbits around Saturn. The bombardment turns that part of the fluffy surface into hard-packed ice. As a result, the altered surface does not heat as rapidly in the sunshine or cool down as quickly at night as the rest of the surface, similar to how a boardwalk at the beach feels cooler during the day but warmer at night than the nearby sand. Finding another Pac-Man on Tethys confirms that high-energy electrons can dramatically alter the surface of an icy moon. Also, because the altered region on Tethys, unlike on Mimas, is also bombarded by icy particles from Enceladus’ plumes, it implies the surface alteration is occurring more quickly than its recoating by plume particles.